I was really pleased to see the theme for this uniko challenge – Distressed or Vintage. I love the distress look and this used to be my go-to style. When it came to it though I really struggled and was unable to come up with anything I was happy with. I was determined to come up with something though so changed my tack and went with the Vintage theme. 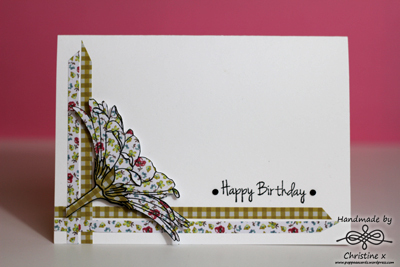 I used the outline stamp from Pure Florals: Gerbera to create some layers on some sheets of patterned paper. The petals themselves are layered and I have curled them to give some dimension. The flower is popped up on foam squares and I added some strips of paper to frame the flower. This is a very different style for me so let me know what you think! What a lovely card. love the paper piecing on the Gebera. Thanks for playing along with us at Uniko Studio.